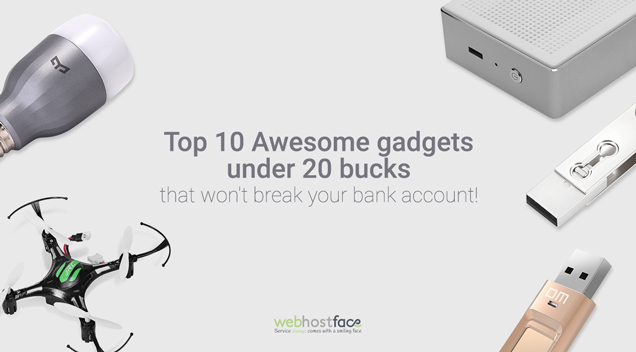 Home >> Free Time >> Top 10 Awesome gadgets under 20 bucks that won’t break your bank account! Although the holiday season is over, everyone loves presents. Here is our suggestion for top 10 gifts and awesome gadgets that you can get either for you or your friends and family for under 20 bucks. The value of these tools is far much higher, having in mind you can use most of them every day, several times a day and this all won’t affect your bank account. Get effective yeat cheap gifts for your close ones. Check the 11th product as it is the only product that can help you make money and it comes for way less than a dollar a month! Xiaomi Yeelight E27 Smart LED Bulb is a great home lighting tool. Fully adopting high-quality LED chips, the 4000K white light with adjustable brightness provides you with the wonderful lighting experience. It brings you pure, natural and comfortable white light as well as balances the brightness. Meanwhile, it uses professional high-temperature resistance capacitance as a power core device to ensure ultra-long lifetime that is up to 11 years. This super affordable Bluetooth speaker is the perfect companion for outdoor activities. With battery life up to 10 hours, why not take it to your next picnic trip with your friends and family to enjoy your favourite music. And not only outdoor activities, it is way better than any laptop built-in speaks, which makes it great for watching movies in the bed. Storage space can be divided into private and public areas, how you need it, how you divide it. The information stored in the public area can be read and used by anyone as long as U-disk is being inserted into a computer’s USB port. However, the private area remains hidden in your U-disk as always, and can only appear with the corresponding fingerprint authentication. We’ve all experienced the trouble of plugging or unplugging our smart devices while driving, in the dark, or when in a hurry. Using a magnetic cable is a simple solution that makes your charging experience easy. It is just a USB stick, not much can be said, but the combination of micro usb and standard usb makes is quite useful to transfer data from your phone to the usb device. Mi Band 2 is a smartwatch bracelet for you, especially for sports lovers. Easy to track your steps, heart rate, distance, burned calories etc.. with IP67 waterproof, compatible with iOS and Android and with over a month battery, it is a bargain. 7. Quadcopter 6 Axis Gyro Aircraft – One Key Return! Cheap yet quite featured small quadcopter to join the drone enthusiast hobby. With 6 axis gyro: For more stable flight and stronger in the wind. There comes a time in everyone’s life when they look over their desk for a place to plug in their phone, a new wireless mouse, a portable hard drive, or some other peripheral, only to discover they’re out of USB ports. When that happens, it’s time to buy a hub. Xiaomi’s Bluetooth headphone receiver is sleek and quite affordable. Just pair it with your phone, laptop or any device with Bluetooth, and start listening to your favourite music without having to be covered in wires. Nowadays, we have multiple devices that need charging. This is an awesome solution to charge up to 3 devices at the same time take just one whole in yours. Get a fully featured hosting account that can help you launch your dream website in a matter of minutes – NOW with an amazing discount as we know how hard is to start a successful online business. Every cent counts at the beginning and we are here to help you start your online project with a minimum investment. Valentin is the biggest Bimmer fan in the office and he says that the best way for him to relax is taking his BMW for a long ride on the mountain roads. He is also a big fan of American Dad and Family Guy and can browse the web for hours for funny videos and images.